Like any other fashion item, jewelry can be subject to the whims of what is popular at the moment. 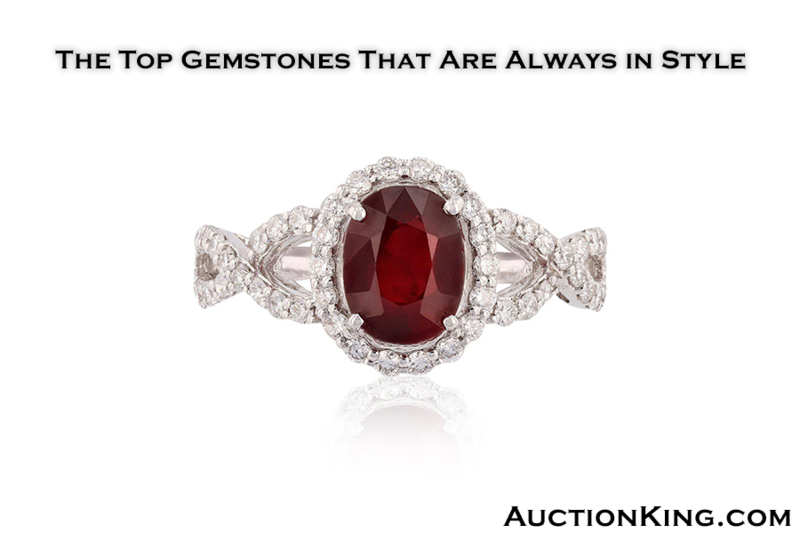 Every year arbiters of taste will proclaim the latest trends in gemstones, often directing attention to lesser-known gemstones or promoting interest in gems that might have once been coveted but have since fallen out of favor. However, fine jewelry isn’t subject to all the same rules as other fashion items, because unlike a dress or a pair of shoes, a well-made piece of quality jewelry can last generations. Because of this factor, some gemstones simply transcend the fads of the moment, remaining perennially in style. Which stones fall into this category? Wearing your birthstone transforms any piece of jewelry into a potential conversation piece. Many who choose to wear a certain stone for that reason often enjoy delving into the history and lore associated with it as well for added interest. The big three: Emeralds, sapphires, and rubies are classic gems, and probably among the first that come to mind when you think of colored gemstones. They have been favorites in cultures around the world for thousands of years as much for their value as for their beauty. The finest examples of each of these stones can be more expensive than diamonds on a per-carat basis. The enduring popularity of these stones means that you can find intriguing vintage pieces incorporating them, giving you the choice between contemporary styles and traditional looks. Diamonds: These brilliant gems have as long a history as the big three, even though the custom of proposing with a diamond ring is a relatively recent development in the stone’s history. Before the nineteenth century, diamonds tended to be associated with royalty, and India was thought to be the sole source of the stone. The discovery of diamonds in South Africa increased supply at the same time as improved cutting and polishing techniques were helping to bring out the stone’s true beauty. As the hardest of all gemstones, diamonds are perfect for everyday wear, a distinction few other stones can match. They also pair well with any color, making them easy to match with any item in your wardrobe. At AuctionKing.com, we maintain an extensive selection of rings, bracelets, earrings, necklaces, and pendants featuring a wide range of gemstones, from trendy to classic. Bid on authenticated pieces easily from the comfort of your own home on our secure proprietary bidding platform. We bring the value and excitement of the live auction experience to you! Register for a free online account today to find your next treasure. Next PostNext Who Is Norman Rockwell and Why Are His Paintings So Famous?